When my two oldest sons were two and four, they just didn't like eating veggies (they're kids, right?). I was concerned and I wondered, “How am I going to make those kids healthy? !” Then a friend told me about the benefits of smoothies and how easy it is to add vegetables to them. Right then and there I decided that was the answer to my concern. To make sure my kids would like my smoothies, I started by making them very sweet and creamy with lots of bananas and very little green. As time went by, I made them greener and greener. Today my kids LOVE green smoothies, and that makes me very happy! This berry cinnamon smoothie is one of my family’s favorites; the last time I made it my kids literally screamed for more. It’s so smooth and creamy you’d think it was made with bananas. 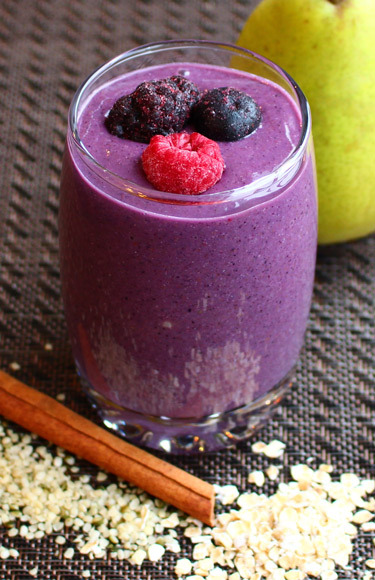 Place all ingredients in your Blendtec. Press the smoothie button once. If you don’t have a Smoothie button, blend on Medium Low or Medium for 10 seconds, then blend on Medium High or High for 30 seconds. That’s it! It’s 162 calories per serving, with 34% of your daily fiber requirements, 17% of your calcium needs and plenty of other healthy nutrients and minerals. I usually double or triple the recipe. You can make it a smoothie bowl if you put half of the almond milk and add granola on top—so delicious! About the Author Melissa is a competitive swimmer-turned-smoothie-fanatic. A busy wife and mom of three, she’s passionate about feeding her family tons of fruits and veggies. She found smoothies to be the best way to do it, and shares her passion with everybody. Follow her on Facebook or Pinterest for daily inspiration, or sort through her recipes on her website!